Goal: To explore the aspirations of the residents and the importance they place on identified physical and social characteristics in the community. Audience: Teenagers, women and men. This activity uses visual symbols to understand the importance that residents place on certain physical and social characteristics. 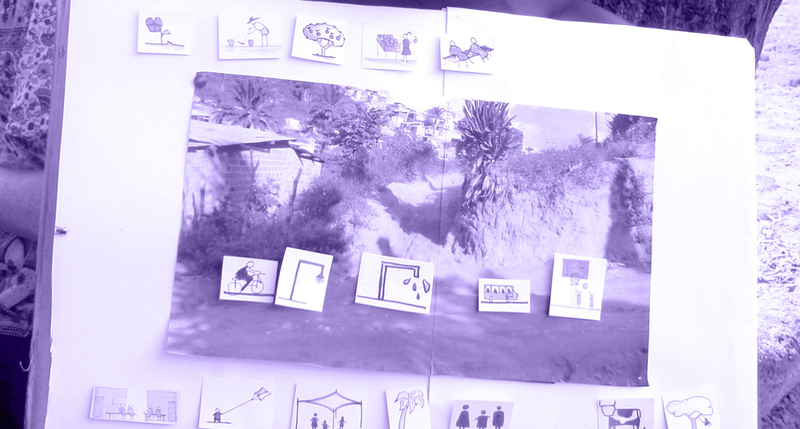 Participants choose from a selection of symbols which reference aspirations i.e. improved access, space for games or sheltered areas (see above). Those willing to be a part of the exercise are shown a photograph of an area that has been identified as a location to improve on, as reflected in the findings from previous exercises. Participants should place symbols based on their own opinions and shouldn’t be influenced by facilitators or other residents. Other participants should wait to be asked the same question and should not be influenced by the answers that have come previous. Notes on the answers should be taken or facilitators should take photos of the participants and their answers, along with their age and gender. Responses should be cross referenced with one another and findings from other exercises and general aspirations should be noted. Step 1: Number each photograph. Prepare a board with each picture and corresponding set of symbols. Symbols should include physical elements but also social activities. The activity takes place on an individual basis, record the name, gender and age of each person before starting. Step 2: Ask them to choose one of the photos/sketches to use as a canvas. From the different symbols provided, only a maximum of 5 elements can be used, meaning participants will have to prioritize which ones are most important to them and that they consider crucial to transform the area. Question their decision and note down their reasons for it. Step 3: If possible take a photo of the participant holding the photo/sketch with their selection. Notes for facilitators: This exercise will be much more beneficial if you have completed a mapping exercise beforehand. If this is not possible, you will need to at leas speak to a number of residents, walking around the site and ask them which spaces they like and dislike. Take photos or sketch each place. This will for the basis of the Priority Tool Kit. Make sure to keep participants separate from others who wish to do the exercise. This will ensure that they will not influence the choices of others. Choose symbols which are appropriate for the community and the context, i.e. Some symbols will not be so necessary for an urban occupation as opposed to a rural occupation.